Geysir (Icelandic pronunciation: [ˈceːisɪr̥]), sometimes known as The Great Geysir, was the first geyser described in a printed source and the first known to modern Europeans. 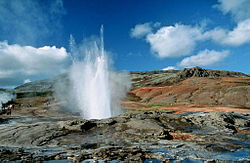 The English word geyser (a spouting hot spring) derives from Geysir. The name Geysir itself is derived from the Icelandic verb geysa, "to gush", the verb from Old Norse. Geysir lies in the Haukadalur valley on the slopes of Laugarfjall hill at 64°19′0.05″N 20°17′59.64″W, which is also the home to Strokkur geyser about 50 metres south. The research of sinter shows that Geysir has been active for approximately 10,000 years. The oldest accounts of hot springs at Haukadalur date back to 1294, when earthquakes in the area caused significant changes in local neighbouring landscape creating several new hot springs. Changes in the activity of the Geysir and the surrounding geysers are strongly related to earthquake activity. In records dated 1630 the geysers erupted so violently that the valley around them trembled. The placename "Geysir" has been first mentioned in written sources in 18th century and, as unusual natural phenomena were of high interest to the society during the Age of Enlightenment, the term became popular and has been used for similar hydrothermal features worldwide since then. In 1845, it reaches a height of 170 metres. In 1846 the research of Geysir by Robert Bunsen results with the explanation of the mechanism of geyser activity. Measurements of professor Bunsen in this year show that Geysir was erupting 43 - 54 m high. History of recent centuries shows that earthquakes have tended to revive the activity of Geysir which then subsides again in the following years. Before 1896, Geysir was almost dormant before an earthquake that year caused eruptions to begin again, occurring several times a day, lasting up to an hour and causing spouts of up to 60 metres in height. In 1910, it was active every 30 minutes; five years later the time between the eruptions was as much as six hours, and in 1916, the eruptions all but ceased. In 1935 a manmade channel was dug through the silica rim around the edge of the geyser vent. This ditch caused a lowering of the water table and a revival in activity. Gradually this channel became too clogged with silica and eruptions again became rare. In 1981 the ditch was cleared again and eruptions could be stimulated, on special occasions, by the addition of soap. Following environmental concerns the practice of adding soap was seldom employed during the 1990s. During that time Geysir seldom erupted. When it did erupt, it was spectacular, sending boiling water sometimes up to 70 metres into the air. On the Icelandic National Day authorized government geologists would force an eruption. A further earthquake in 2000 revived the geyser again and it reaches 122 meters for two days, thus becoming one the highest known geysers in history (Waimangu Geyser in New Zealand has been erupting up to 460 m high). Initially eruptions were taking place on average eight times a day. By July 2003 this activity had again decreased to around three times per day. The nearby geyser Strokkur erupts much more frequently than Geysir, erupting to heights of up to 30 metres every few minutes. Strokkur's activity has also been affected by earthquakes, although to a lesser extent than the Great Geysir. Due to its eruption frequency, online photos and videos of Strokkur are regularly mislabelled as depicting Geysir. There are around thirty much smaller geysers and hot pools in the area, including one called Litli Geysir ('Little Geysir'). Descriptions of the Great Geysir and Strokkur have been given in many travel guides to Iceland published from the 18th century onwards. Together with Þingvellir and the Gullfoss waterfall, they are part of the Golden Circle that make up the most famous tourist route in the country. A forest near the Geysir. Until 1894 the Geysir area was owned by a local farmer. In that year the area was sold to James Craig (later Lord Craigavon), a whisky distiller and future Prime Minister of Northern Ireland. Initially he erected large fences around the site and an entrance fee was charged for visitors wishing to view the geysers. The following year, however, Craig appeared to tire of his project and gave the area as a present to a friend, E. Craig, who dropped the entrance fees. Later Craig's nephew Hugh Rogers inherited the site. In 1935 he sold the site to film director Sigurður Jónasson who subsequently donated it to the Icelandic people in perpetuity.